I have a bit of a problem: I can’t stop downloading weather apps. Not all of them, mind you. But every few months or so there’s been a prettier, more useful weather app that I have just had to try. I will admit I’m a bit weather-obsessed (it’s one of the first two apps I open when I grab for my iPhone in the morning). But there’s no other category of app that I’ve experimented with so frequently. Why has this particular category gotten increasingly good in the last few months? Because designers are starting to care about it, and data crunchers are jumping in too. Justin Re, CEO of Minutely, an app that debuted Monday, has been working on his take on a weather forecasting app for over a year. He said what we’re seeing now is just the beginning of where once-basic apps showing the current conditions and forecasts are going. While Minutely uses Weather Underground data, it also brings in NOAA radar information, and crowd-contributed weather reports (like Waze, if a certain number of people in a certain area report something, the app will report that data). But that’s not all: Re is planning on adding even more sources of data as they become available — he’s looking at everything from cameras that can provide weather information, to the sensors inside the hardware most of us carry with us everywhere: some Android(s GOOG) phones have pressure sensors built in, which can help give information about atmospheric pressure. “We will look to tap into those on the hardware as well. And, I think, as smartphones develop there will be more sensors” to derive data from, he said. Minutely is very data-heavy. But it uses a simple layout and cheery design to make the amount of information it shows you digestible, useful and not overwhelming. Its big differentiating factor, however, is its rendering of weather data in 3D. No other weather app is using that yet, and Re says what’s in the app is just the beginning of how multiple dimensions can give a more accurate picture of weather nearby. Price: free. Haze is all about design. 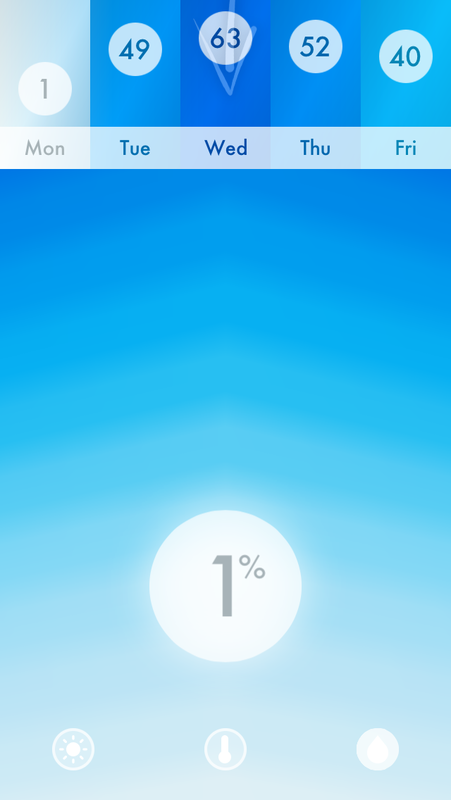 It’s certainly the most elegant weather app I’ve ever used. Haze uses animations in the background to convey tomorrow’s forecast, including temperature and chance of rain. You can also swipe left to right to cycle through forecasts, or up and down to reveal additional detail and menus — or simply tilt the device instead. Haze’s designers use principles that Apple has shown it will make liberal use of in iOS 7 — transparency, layers and flat simplicity — to wonderful effect. Price: $2.99. Dark Sky has been my constant companion in Philadelphia this summer (we’re currently enjoying our rainiest summer on record). The super accurate radar visualizations — which are helped along by voluntary crowdsourcing — are incredibly helpful when you’re trapped indoors waiting for a torrential storm to pass and you’re wondering whether you should just run for it and get soaked. Dark Sky shows you how long until the rain stops or lightens up, and can see up to an hour into the future. Price: $3.99. 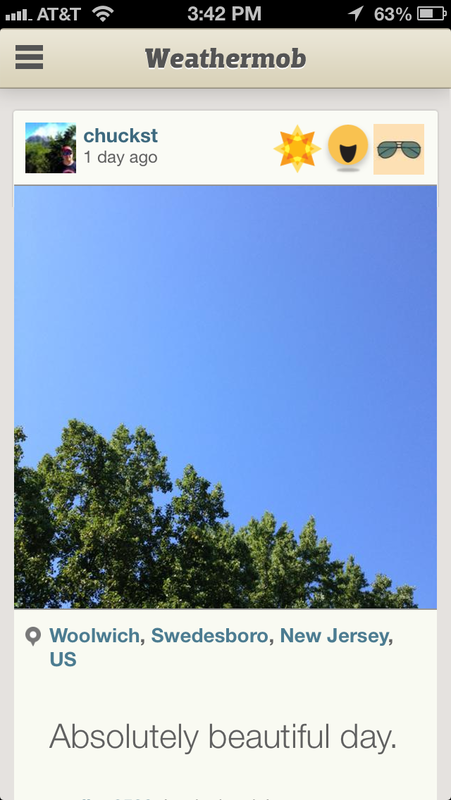 Weathermob is the social weather app that uses user-submitted images to offer insight of what kind of day it is outside. You can search nearby, by tags (and users’ feelings and moods) or scroll through the image feed to see weather from anywhere in the world. Conditions is as basic as it gets. But it’s also refreshingly clean. This is for you if you want a distraction-free replacement for the iOS stock weather app — and if you’re willing to pony up some money for it. Price: $0.99. Things are changing quickly in the world of weather on mobile — data, design, social elements and more are important principles of building almost any successful mobile app these days. (If you want to hear more about this, definitely plan to attend our RoadMap conference in November.) So if you haven’t tried out anything beyond the stock iOS weather app on your phone, know you’re missing out. In Canada, there’s no substitute for Environment Canda data. There’s a tiny ad-free app by Metsoft (Laos, apparently) that quickly lists cities, displays EC’s own pages, and saves the last selection as default. I am using a couple of IOS Apps myself – I like Yahoo, it has a very nice UI and I use it in general. When I need highly accurate prediction (is the rain going to stop anytime soon in MY location) – I switch to Nooly, which is really great for near-term localized prediction, but doesn’t have the great user experience of Yahoo. I’m a weather geek too and by far the best app I’ve come cross is My-Cast. It’s so good that you have to pay a MONTHLY subscription – but I’ve found when it comes to weather you get what you pay for. Realtime radar, cloud coverage, hurricane tracking, even lightning strikes, along with hourly forecasts. I gave up on weather apps. NOAA (weather.gov) gives me better and more reliable data. They have a concise writeup of conditions for the next week (with day and night separate). They have a graph of about 10 weather data elements by hour for 48 hours. 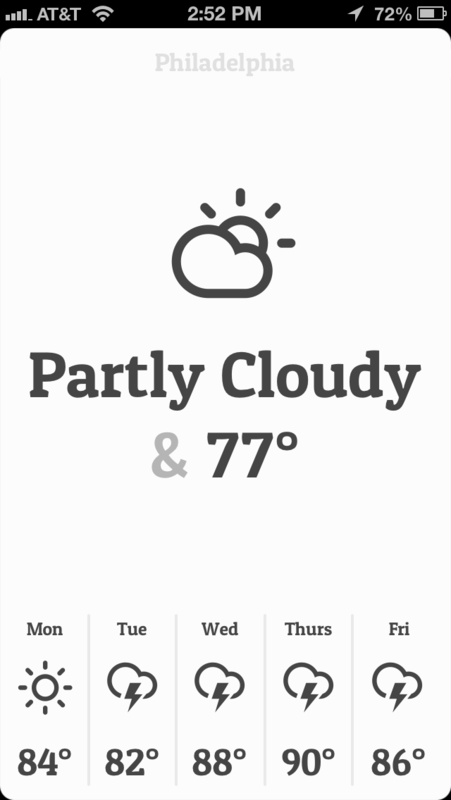 They have a quick forecast page that’s as pretty as any weather app. They also have a mobile site (mobile.weather.gov) for phones with smaller screens. Plus – no ads. How is the Yahoo Weather App not here? It’s one of the more elegant apps that has all the info you need in one spot. Be careful with an app such as Minutely which heavily depends on Weatherunderground. WU accepts data from personal weather stations. Some of those stations can be woefully wrong, but WU has no way of knowing whether the contributing station is correct or not. I won’t buy another weather app. I always find a significant problem. For example, the closest Weatherbug reporting station from my home is 20 miles away and that represents a different elevation by 1,400 ft. That makes the Weatherbug app worthless to me. Weatherbug shows my town’s name, but it’s really a town 20 miles away. you should try out the Nooly Micro Weather app. 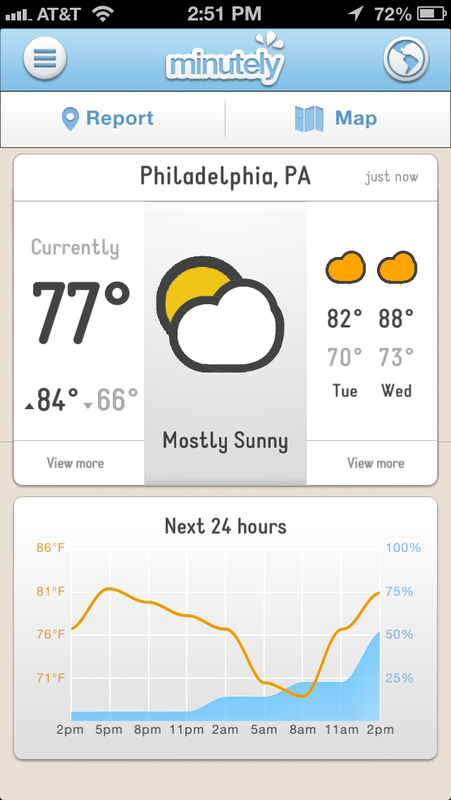 Nooly is arguably the most accurate and the most localized weather prediction app in the market today. it predicts the minute rain starts for every 0.4 square miles and have an elevation correction (for temperature prediction) every 1 – 2 square miles. you will also enjoy minute-by-minute satellite base cloud coverage prediction in a 0.6 square mile resolution. Surprised that the Yahoo Weather app was not included here. It’s design is wonderful and provides additional weather information like wind speed and direction, and sunrise and sunset time and moon phases. 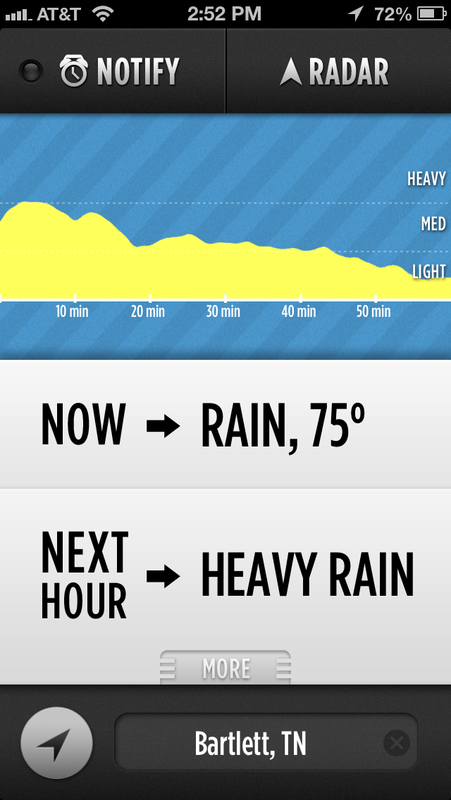 It was mostly design-focused, so I definitely agree with the data aspect of weather apps. I’ve also been downloading many alarm clock apps lately, and find SleepBot the best of alarm clock app of all because it also tracks your movement and the sounds you make during the night, and keeping all of this information, including how long you sleep, in a very easy-to-use sleep log.